Former White House chief strategist Steve Bannon has described “three converging forces” shaping world politics: populist nationalism, the emergence of blockchain and cryptocurrency, and the movement for “digital sovereignty” in the face of overmighty tech firms. Bannon laid out his beliefs in an interview with Lionel Barber, editor of the salmon-pink Financial Times newspaper — part of the unofficial uniform of the financial elite in the City of London. 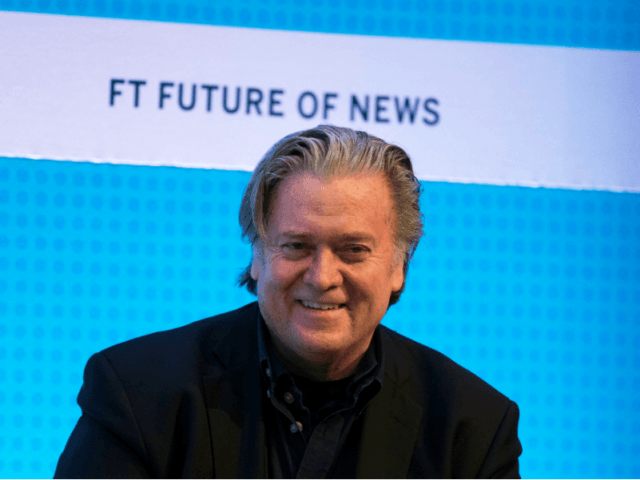 Barber, whose newspaper has been wholly devoted to the European Union and the process of globalisation over the last several decades, was at pains to assure the audience at the ‘Future of News’ event that Bannon was not receiving any remuneration for his appearance, having been criticised by much of the establishment for providing the American with a platform at all. Bannon says the three pillars of his new ideology are nationalism, cryptocurrencies, and digital sovereignty. “You have three converging forces, I believe, in the world,” the former Breitbart News executive chairman told Barber. “Number one is this centre-right, populist-nationalist movement that is politically driven, and it’s driven a lot by social media. “On the second, you have this cryptocurrency, or blockchain. “And the third, you have this concept of digital sovereignty — the taking of your intellectual property assets. “And they’re all converging, I think, to empower this movement,” he said, referring to the popular movement against supranationalism and globalist ‘citizens of the world’ which Hungarian prime minister Viktor Orbán recently described. “Central governments debase your citizenship, central banks debase your currency, and the central, technocratic state capitalism we have with Google and Facebook take your personhood, and basically take away your intellectual property, your digital sovereignty” Bannon continued. “Right now, you’re serfs. You’re well-paid serfs, but you’re serfs. They’ve debased your currency, and so you’re continuing to underwrite debt for sovereign governments at zero interest rates, so you’re always on the spinning wheel like a little hamster, trying to get ahead,” he told the audience. Barber was keen to steer the conversation to more comfortable topics, trying to suggest Bannon was an admirer of Fascist leader Benito Mussolini and proposing that U.S. President Donald Trump’s plans for a military parade in Washington D.C. made him a kind of latter-day Julius Caesar — but failed to land any telling blows. “This is the great thing about the propaganda media,” answered Bannon. “[Economic nationalism] doesn’t care about your race, doesn’t care about your colour, doesn’t care about your ethnicity, doesn’t care about your gender, doesn’t care about your religion, doesn’t care about your sexual preference. 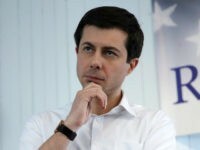 “It cares about one thing: that you’re a citizen of the United States of America,” he said, citing low turnout for Hilary Clinton among working-class black and Hispanic voters before the election and rising prospects for those groups after the election to show how the concept works. 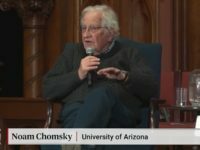 “That’s why I told these people, listen, the identity politics that Hilary Clinton came out with … racism, white supremacy — I sat there, and I told [the team] right there, ‘If she’s gonna run on identity politics and we run on economic nationalism — this was August 19th, and we’re down by 12 points — we are going to beat her. And we did. “If they call you a racist they have nothing else to argue,” he concluded. On Marine Le Pen and the Front National more particularly, Bannon was candid. “Was I up there to say, ‘Those people are perfect’? They’re not perfect. The Deplorables are not perfect. I’m not perfect. “I believe in the tenet of the Judeo-Christian West that man is fallen — we’re not perfect. “But those are working-class people in France … I went there for one reason, to tell them they’re not alone. “That this anti-establishment, populist-nationalist movement, as personified in Italy a couple days before, where two-thirds of the people voted anti-establishment, is on the rise, it’s on the move, and it’s only going to get stronger, it’s only going to get more powerful.